With the arrest of Ammond Bundy and 6 other protest leaders in Burns, Oregon the U.S. Federal Government has shown its true colors. That it will kill and intimidate the citizenry whenever it serves their tyrannical purposes. By killing LaVoy Finicum the government has just created the first martyr of this honorable and noble protest movement. The whole dynamic will now change with the unnecessary spilling of a true patriot’s blood. Good people like LaVoy Finicum do not involve themselves with matters like this unless they are completely convicted with the righteousness of the cause. For LaVoy what was truly at stake in Burns, Oregon was worth his very life. He knew exactly what he was fighting for —“life, liberty and the pursuit of happiness” — for him, his family, and his fellow Americans. Unknown to most, one of the greatest forces behind this patriot movement in Oregon was LaVoy Finicum. The FEDs knew this. They also knew that his courage and intestinal fortitude were infectious. And that he would infect many other lesser men and women with the courage of his convictions. Don’t think that the Obama Administration wasn’t more afraid of LaVoy Finicum than all the other protesters put together. Lavoy had nerves of steel. The FEDs knew that they had a fierce and ferocious, indomitable and unstoppable patriot in their midst. They therefore calculated that LaVoy must be eliminated as he posed the greatest threat to their unmitigated tyranny. It is extremely important to understand that the U.S. Government just carried out a premeditated and pre-planned assassination of perhaps the most stalwart patriot in the State of Oregon. This brutal murder was staged as a public execution as a warning to others not to get involved with the patriot movement. They savagely killed a foster parent to troubled boys who presented no danger to any living being. You want to see what kind of man LaVoy Finicum really was. This is the man of real courage, of self-sacrifice, of resolve, of valor, of perseverance, of true bravery that he was really was. This is the man who the U.S. Federal Government just took out in order to advance their oppressive and repressive, tyrannical and despotic New World Order Disorder. The article posted below says it all about the irrepressible LaVoy Finicum. May God Bless LaVoy Finicum and his beautiful family! And may he rest in peace in the highest of Heavens. Oregon Public Radio reports that Finicum and some of his comrades were pulled over between the towns of Burns and John Day at around 4:30 p.m. local time. During his involvement in the Malheur standoff, the 11 foster children that were in the care of Finicum have been taken away. Finicum complained that those children were he and his wife’s major source of labor and money on their ranch, reported Time Magazine. 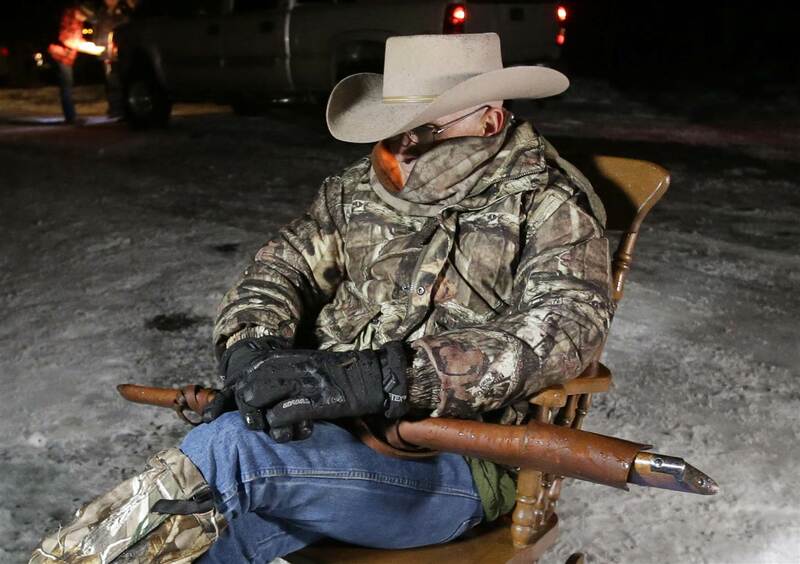 An MSNBC report on the standoff dubbed Finicum “Tarp Man” as he could be seen covered in a blue tarp with a rocking chair during the incident. According to Mormon tradition, cremation is not encourage and a proper funeral burial is preferred. Meanwhile on his wife, Jeanette’s LinkedIn page, she lists foster care provider as her full time job. It’s unclear who shot first but one person was taken to a nearby hospital with non-life threatening injuries. Michele Fiore said that person was Ryan Bundy, another son of Cliven, who was shot in the arm.